The illegal regime's mickey mouse march for Josefa Iloilo continues to draw comments. This opinion piece reveals that those who marched had also trod ground in recently liberated Egypt. One of the most crass breeches of state protocol was committed by the President and Commander in chief Epeli Nailatikau marching with troops during the state funeral for former President Ratu Josefa Iloilo. Modern Heads of state or even Commander-in-chief of armed forces, Do Not March! in formation with troops as the incumbent is the fount of all state ceremony. All official state ceremony is carried out with the supreme office bearer remaining aloof as the head of state. All military honour and homage is also paid by servicemen/women to the head of state in any state military parade or procession. The flying of regimental and presidential colours draped with black streamers paraded with the funeral procession is sufficient symbolic representation of the head of state. Does Her Majesty the Queen march in formation with her troops? Definitely Not! Her Majesty as the fount and object of the state takes the salute on behalf of the state! She remains aloof as state protocol demands. What can we make of this state faux pas? Was it deliberate? The military funeral procession was clearly choreographed to show military solidarity and a 'closing of the ranks'. However, the adage 'Keep my friends close and my enemies closer' springs to mind when one looks at the funeral military procession photos, given the recent rumblings of assassination plots and regime corruption twists. 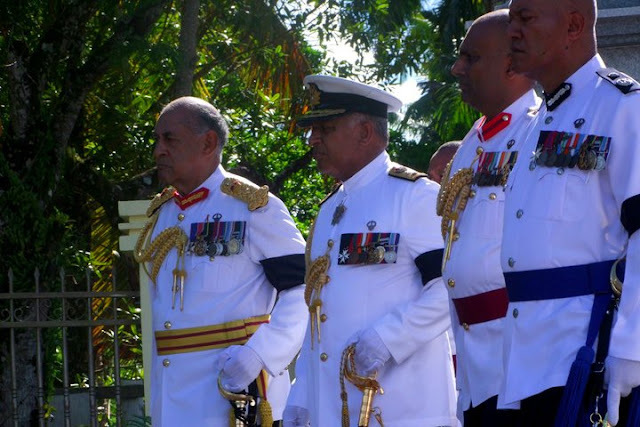 It seems the Commander Frank Bainimarama flanked by the President Nailatikau to his right and Brigadier General Mohamed to his left aptly epitomized the cliche. Both have been fingered as conspirators in a plot to get rid of el supremo. Further more, if there is one thing that binds all those that marched during the state funeral procession, it's this: they all served in Egypt with the MFO during ousted president Hosni Mubarak's rule and know of the Pharaoh's curse! Let my people go! I knew their was something about these series of photos which niggled at me and I've just worked out what that was. They prove without a doubt, that each is part of this illegal coup. They also seem prophetic in so much as the same people in these photos, will soon be in another, only in Prison Uniforms. such telling photos ... what's the saying: a picture paints a thousand words. where to now for this motley lot??? can't wait further developments - one of them will break ranks, i bet. So they served in Cairo/Egypt while Mubarak was still in power. Learnt from the best, did they. Pity they've garnered little that has been good for Fiji; really such a waste of resources and contribution. Imagine what a wonderful country Fiji would be today if the army and its leaders had used their training and toil for good rather than evil. If they had thought of our children and future generation rather than their own pockets. @ Humanitarian Tribe..fiji is sill as good as any other day..even better..dont make comparisons cause I think you are just too bitter cause you have missed out on what you used to enjoy under a democracy..get a life.. The current was so dump to even figure this out or else he was taking orders from someone he fears the most that if he didnt join the march he will be exploited together with his accomplices. Notice how very quiet the pro regime bloggers and Croz are on the very quick inquiry into dealings at FHL. Certainly not going to mention it unless pushed. All too inconvenient isn't it!! one rule for us one rule for the military.Perghaps no comments will be published because drawing attention to it is 'unhelpful and impolite'. Pharaoh's curse on Egyptian leaders who mistreat their people can apply to Fiji. Frank did the right thing by removing corrupt chiefs, politicians, talatala and civil servants. However, he must be consistent and if information learnt from this blogsite on supposed underhand deals with local and overseas crooks is indeed true, then, Frank will be brought down and another leader picked. Eg. Frank should take heed of Fr Barr's call for just wages for the people. He should stop listening to rich business people (FEF)and order RBF to undertake an audit trail on exporters as he did for Fiji Water. Ignorant Narsey made fun of Barr for crying. Barr did not cry for himself. Let me tell Narsey that Barr cried for the poor.God does not tolerate pride and greed at the expense of the poor & ignorant and if Frank continues, he too will be removed from his seat like those before him. was imported into Viti via returning UN peacekeeprs. LOL! If you were here at home in Fiji, you would've learnt by now that our President rubs shoulders with the public whenever, I've passed him many a times along Victoria Parade, or cuing up at the ATM etc. He, like his late father, likes to get involved with the citizens of Fiji. It's actually very humbling, which President in the world walks unguarded or unescorted in town? Just because the Queen sits aloof in her high seat, that does not mean we have to follow her! Helllloooo! You have to be here to know what's actually happening! What the faux pas as you call it may mean is that Ratu Epeli is a team player and to march behind the coffin of Ratu Iloilo is for him the honourable and right thing to do. Why should he be caged in Government House? It may also mean that he is President only as a matter of convenience and is not likely to remain so after the next elections but no matter because Ratu Epeli is an honourable man. Did you know there's a theory that the first Fijians came from Egypt? So there may be a connection to the Pharaohs after all. The Illegal Prime Minister was not there because of the corruptive practice of the SDL, it was him trying to hide the corruptive practice at Delainabua.